LiveCode LessonsLiveCode LessonsHow To - Step-By-Step Guides To Tasks In LiveCode Using DialogsHow can I restrict an answer file dialog to just applications? ## Shows a select file dialog filtered to only show applications then puts the selected filepath into field "Filename"
put it into field "Filename"
The answer file script can be filtered by file type using the format "tag|extensions|filetypes". 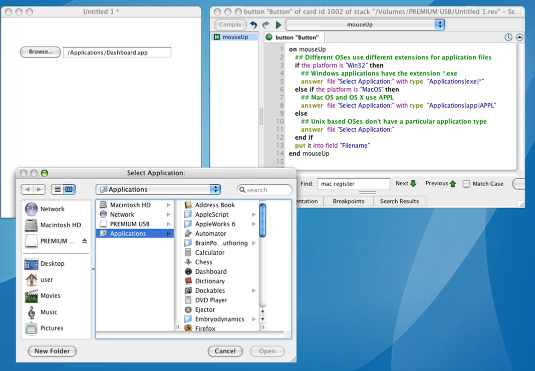 In this case, for Windows computers we use "Applications|exe|*". 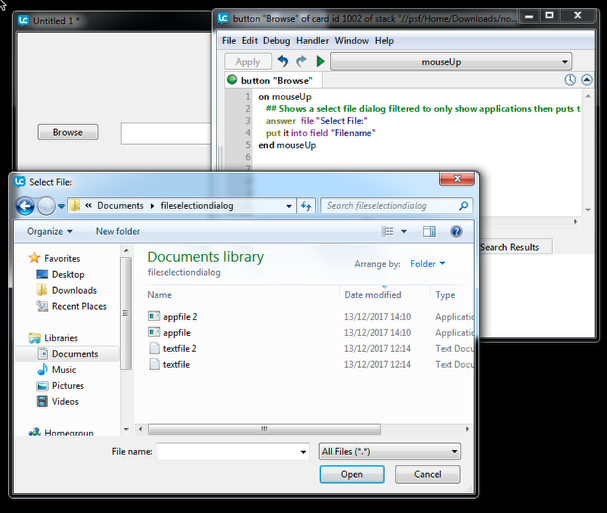 We can put any number of comma delimited options in the extensions and filetypes sections. Files that match any of those extensions will be shown. We could also add another line of "tag|extensions|filetypes" if we wanted the user to select from several filters using the "Files of type" option menu. 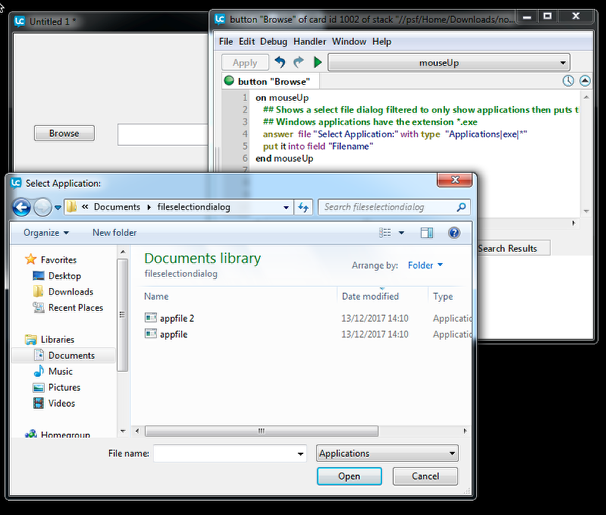 answer  file "Select Application:" with type  "Applications|exe|*"
Now the folder we opened only shows applications. Different operating systems use different application file types, the operating system can retrieved using the platform function. answer  file "Select Application:" with type  "Applications|app|APPL"
Prev: How do I Create a Color Picker Swatch? Next: How Can I Pass Data To and Get Data From a Dialog Window?